Mickey Jones, who was a popular character actor in both film and TV along with being a drummer for Kenny Rogers and the First Edition died on Wednesday (February 7) morning at the age of 76. No cause of death has been released but, according to TMZ, he had been in and out of the hospital a few times in the past months. Jones was born in Houston and attended Sunset High School outside of Dallas where he first started playing drums in local bands. In the late-50's, he became the drummer for Trini Lopez but left in 1959 to go to North Texas State College, getting a degree in business administration. After graduating, he moved to San Diego to work in industry but wasn't happy with the job and moved to Los Angeles to get back into show business. Soon after, he once again became Lopez' drummer. By the mid-60's, Jones started working with other artists including Johnny Rivers and Bob Dylan, taking the place of Levon Helm for his 1966 tour of Australia and Europe. That position came to an end when Dylan had his motorcycle accident and had to take an extended period off, so Mickey decided to try acting, getting a few bit parts. 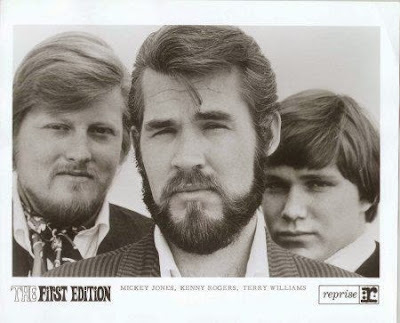 In 1967, he was asked to become the drummer for the new group The First Edition which included lead singer Kenny Rogers and other former members of the New Christy Minstrels. Before the end of the year, the band would have a top ten record with the psychedelic tinged "Just Dropped In (To See What Condition My Condition Was In)" and followed with such hits as "But You Know I Love You", "Ruby, Don't Take Your Love to Town", "Reuben James", "Something's Burning" and "Tell It All Brother". He was also part of the group's variety hour, Rollin', which ran from 1971 to 1973. In 1974, the group appeared in a made-for-TV movie, The Dream Makers, but the exposure wasn't enough to revive their career and, the next year, they broke up with Jones pursuing an acting career. Jones' film career was marked by a number of big hits among lesser fare, including Wild in the Streets, National Lampoon's Vacation, Starman, Total Recall, Tin Cup and Sling Blade while his television credits included a number of appearances on The Incredible Hulk, a recurring role on Home Improvement, a regular spot on Justified and guest spots on over two dozen other shows. He also released his autobiography, That Would Be Me, in 2009.